Written on April 9, 2019 . Posted in Most Read News Stories, Uncategorized. PITTSBURGH (KDKA) — Kathryn Reveille had an abnormal heart rhythm called atrial fibrillation, or Afib. “I had palpitations. Really, really strong palpitations that were disabling,” she said. She tried medications, and endured eight shocks to the heart. Nothing worked to keep it in a normal rhythm. Her heart wasn’t beating effectively. She couldn’t walk without it racing. She had trouble breathing. With Afib, instead of just one area, multiple areas in the top chamber tell the heart to beat. With so many signals, the bottom chambers beat irregularly. “Our goal is to help them feel better. Our goal is to help prevent a stroke,” St. Clair Hospital heart surgeon Dr. Andy Kiser said. Ten years ago, Kiser invented a procedure to control Afib, particularly for people who have been in the rhythm for a long time. Written on March 4, 2019 . Posted in Most Read News Stories, News Releases. Medicare & Medicaid Services (CMS), St. Clair Hospital today was named one of the nation’s 100 Top Hospitals® for 2019. This marks the second consecutive year and fourth time since 2012 that St. Clair has won this prestigious honor. 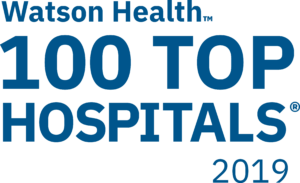 The 100 Top Hospitals award is the culmination of an annual study by IBM Watson Health that identifies top performing hospitals in the country based on overall organizational performance. Formerly known as the Truven Health Analytics 100 Top Hospitals, this study spotlights the best-performing hospitals in the U.S. based on a balanced scorecard of publicly available clinical, operational, and patient satisfaction metrics and data. To conduct the 100 Top Hospitals study, IBM Watson Health researchers evaluated short-term, acute care, non-federal U.S. Hospitals. Hospitals do not apply or pay for this honor, and all acute care hospitals in the United States are evaluated for potential inclusion. The study has been conducted annually since 1993. The 100 Top Hospitals showed the most significant outperformance versus non-winning peer group hospitals within clinical and operational performance benchmarks evaluated in the study. Written on February 28, 2019 . Posted in Most Read News Stories, News Releases. PITTSBURGH, Pa. (February 28, 2019) ― The Centers for Medicare & Medicaid Services (CMS) today awarded St. Clair Hospital a 5-star quality rating, the highest rating available, as part of its refresh of the Hospital Compare website. It was the only 5-star rating awarded in western Pennsylvania. Since 2016, CMS has published ratings of more than 4,000 Medicare-certified hospitals on the Hospital Compare website to help patients choose a provider based on documented performance in areas such as quality, patient satisfaction, and patient safety. CMS calculates an overall rating using a composite of 57 metrics. CMS uses a 1 to 5 star scale, with 5 stars being the highest rating. The scores are based on hospital performance in seven categories: Mortality; Readmission; Safety of Care; Patient Experience; Effectiveness of Care; Timeliness of Care; and Efficient Use of Imaging. Written on February 12, 2019 . Posted in Most Read News Stories. A Kentucky-based health insurer has struck the first value-based care contract for Bridges Health Partners, the consortium of four independent hospitals in western Pennsylvania. Humana Inc. (NYSE: HUM) and Bridges began the agreement Jan. 1, 2019, for its Medicare Advantage members in western Pennsylvania. While specific local numbers weren’t available, Humana has about 47,000 Medicare Advantage members in the state. Value-based insurance contracts seek to save adverse health effects and costs down the line by promoting among members both early tests and interventions like breast-cancer and colon-cancer screenings and adherence to medications. Bridges is the clinically integrated network between St. Clair Hospital, Excela Health System, Washington Health System and Butler Health System. It’s an accountable care organization (ACO) that offers value-based care for traditional Medicare patients, but the deal with Humana is the first time Bridges has reached a value-based agreement with a commercial insurer. Written on January 3, 2019 . Posted in Uncategorized. While new federal regulations required all hospitals to publish online a list of charges for procedures, supplies and drugs, no one thinks the move goes far enough to help get at the true cost to patients. But one local hospital has been doing just that for the past three years. St. Clair Hospital in February 2016 rolled out its financial tools webpage that provides patients with an estimate of out-of-pocket costs for common hospital procedures, including surgery, colonoscopy, CT scans and sleep studies. “A lot of patients are really price sensitive, especially patients who have a higher deductible, who know they will be responsible for a larger part of health care expenses,” said Beth Pittman, VP and COO of St. Clair Medical Services. Written on October 30, 2018 . Posted in Most Read News Stories. Community hospitals are struggling, partly because of low Medicare and Medicaid reimbursements and private insurers’ emphasis on outpatient care. Yet St. Clair Hospital is prospering in this dog-eat-dog world despite its proximity to the big health care institutions in Pittsburgh. That’s good news for the South Hills — the hospital is located in Mt. Lebanon — and St. Clair’s success offers hope for other community hospitals, too. As the Post-Gazette’s Kris B. Mamula reported Sunday, St. Clair finished the 2018 fiscal year with a remarkable operating margin of 12.2 percent. That’s up 23 percent from 2017 and leaps and abounds ahead of the 4.6 operating margin that is the average among Western Pennsylvania hospitals. Written on July 24, 2018 . Posted in News Releases. PITTSBURGH, Pa. – St. Clair Hospital is the newest member of the Mayo Clinic Care Network, a growing national network of independent health care providers committed to serving patients and their families through clinical collaboration. Written on July 3, 2018 . Posted in Most Read News Stories. Written on May 16, 2018 . Posted in Most Read News Stories. Written on May 10, 2018 . Posted in Most Read News Stories.